Crypto enthusiasts are sitting on the edge of their seats. Bitcoin is “destined” to receive ETF approval and to every bull, that is just about the best and only good news on the horizon right now. But is another bull run possible in 2018? And more importantly: can we get to that coveted trillion-dollar market cap? Ever since bitcoin’s price went from an all-time high of $20.089 in December of last year to this year’s low of $5.893, crypto enthusiasts have been, well, not so enthused. Every upward spike since then has been met by a spark of good news and “hopium” only to be shattered again and again by another sell-off. Even we here at TradingRoomApp have personally encountered this on social media. Every time we speculated on new lows, we were treated with groans and “tweets” of disapproval. Those soon dissipated when our outlook turned to truth. Even now, on Aug 11th, we hold a bearish outlook on the near future. But there’s some good news for bulls. We believe the price of BTC will skyrocket due to the ETF approval. This time though, we’re not in the minority. News outlets and social media are abuzz with the possible ETF approval of bitcoin. “Bitcoin price will reach an all-time high!” the headlines read. According to the pundits the reason for this is simple. “Because that’s what happened to gold.” Accompanying that statement is a nice chart for gold and a chart for bitcoin either side by side or superimposed and guess what? They look similar. Unfortunately, that’s not how it works. There is a blueprint for a trillion-dollar market cap, but its basis doesn’t lie in historic events. It lies in future implications. We here at TradingRoomApp have laid out these events and future implications in a roadmap that we will share with you, but to fully comprehend it, we first need to explain what an ETF is. ETF stands for exchange-traded fund. In layman terms, products can get traded through an exchange, like gold, but without actually having to buy gold. You’re buying the promise of gold. You hand someone money, they give you a piece of paper that says ‘IOU’ on it and now that person owes you gold without ever actually delivering the gold. Now, why would anyone want to buy the promise of 50.000 gold bars instead of actually having it? Because it’s not about owning gold. It’s about owning the price. As an investor, you expect the price to go up and to later on sell the ‘promise’ of gold to someone else for a higher price without having to deal with the logistical hassle of actually owning gold. Try buying 50.000 gold bars from a Saudi sheik, transporting them through a couple of war-torn countries and then stacking them on the kitchen table back home. See what happens. Imagine the cost for transport and security. It is logistically unfeasible. That is why you buy the promise of 50.000 gold bars. The exchange keeps them at a depot where they’re secure and, more importantly, insured. And there we have one of the most important benefits of an ETF: insurance. Why is insurance important, you ask? Imagine going back to 2011. As a crypto investor, what’s the first thing you do? Easy. You buy bitcoin for 1 dollar. From whom? Mt. Gox? For the people not in the know: Mt. Gox was the largest exchange for bitcoin trading. At one point, it traded a whopping 70% of all bitcoins in existence. Until they got hacked. Billions were lost. Employees went to jail. Lives were ruined. Mt. Gox eventually filed for bankruptcy. Even now we’re still dealing with the negative effects of that hack. This incident as well as other incidents on other exchanges have kept many big private investors from investing. With the approval of the “Bitcoin Exchange-Traded Fund” and its subsequent possibility for insurance, the risk is minimized. This approval will set forth regulation that will have a huge impact on BTC and is therefore unequivocally considered a game changer. How will the game unfold? How do we get from a 100 billion-dollar market cap for BTC to one trillion dollars? As what happened with gold, the first bid for ETF approval has been rejected and although the SEC was overall favourable of an eventual approval, it had comments and questions that needed to be addressed. By now, private investors are waking up and looking into investing in bitcoin with a slanted eye at the news here and a whisper to their bank representative there. These rich private investors desire an ETF approval formally for insurance purposes, but informally because an ETF approval means an automatic ‘price explosion’. The thing is: private investors want to get in cheap. A rejection works in their favour, because with millions to invest, receiving ETF approval when BTC’s price is at $7.500 is a large difference from receiving approval when BTC is at $5.800. Expect the market to “shake out the weak hands” during the upcoming weeks, meaning a large push down and heavy price volatility that destroys limit orders and touches every stop-loss on the way up and down. 2. (Another) ETF bid pending. So how will the weak hands actually be shaken out? The same way it always did: through price manipulation and FUD (the spreading of ‘fear, uncertainty and despair’). The best FUD right now is a rejected ETF bid. TradingRoomApp bases its outlook on facts and psychology. Conspiracy is not a trade we deal in, but we do see pattern here. Every upcoming ETF bid is accompanied by the same ‘good news’ articles and every ETF bid rejection is met with the same stories of gloom and doom. The good news is: An ETF can be rejected multiple times, but also put up for approval multiple times. The Winklevoss twins had their ETF rejected and another one has been put up for approval again. This time, the comments and questions have been addressed. This doesn’t mean the next ETF will be approved, but the fact is that with every rejection and with every new bid, approval comes closer. TradingRoomApp’s outlook is that the Bitcoin Exchange-Traded Fund will be approved. We could tell you “Gold went up by 300% and so will BTC after ETF approval” and talk about insurance and other safety measures all day long, but the fact of the matter is: an ETF approval on its own is like a red cloth for a bull — excuse the pun. Why? Because an ETF approval automatically means that the price will skyrocket. It sounds overtly simplistic. “The price will skyrocket, because it will skyrocket,” but that’s the nature of man’s greed reflected in the market. If we told you BTC will shoot up by 300% tomorrow and the chances of that are 90%, would you buy BTC? There is nothing more enticing to a bull — middle or upper class — than the certainty of price shooting up. Yes, private investors with big wallets speculate same as “lesser” bag holders and traders. And, same as everyone else, they FOMO in as well. When price shoots up, they will invest even more. This makes ETF approval a self-fulfilling prophecy that is trapped within a vicious cycle. “Price goes up, so we buy it, so the price goes up, so we buy it,” etc. The price of BTC will shoot up. To tickle your imagination, consider this: We’ve all seen the order books. We’ve all noticed those transactions where someone just filled in an order of 1.500 BTC. That ‘whale’ is nothing compared to the wales that will enter the market when ETF is approved. And we’re not even considering institutions. Forget institutions. We are talking about people who are just like you and me, with the same emotions, the same tendency to speculate, but who simply have a few hundred million dollars more. Perhaps even a few billion. And they will play the same games we do, but with higher stakes. A 1.500 BTC transaction will seem low in a few years and that will have nothing to do with BTC’s price and all to do with the players who entered the game. Will the approval of the ETF ignite the spark of another bull market? Yes. Will it come in 2018? That depends on when the ETF will be approved. Rumours of a “certain” approval could spark a small bull run in 2018, but if the actual approval comes in 2019, expect the overturn of the market to be then. So, out of those 17 million, 4 million were lost. That means we are left with a supply of 13 million bitcoins. Out of that 13 million it is estimated that between 20–30% is locked due to various circumstances, like account holders being deceased or non-active. Take Satoshi Nakamoto’s account as an example. So, let’s assume a circulating supply of 10 million bitcoins. Over the course of twelve to eighteen months the price of BTC will have shot up due to high demand. How high? We refrain from spewing jargon, going too deep into the mathematics and the research, but we need to consider the following: even if the entire stock of 10 million BTC is absorbed at an average of 40.000 dollars per BTC, only a push of about 250–300 billion is required to get to a trillion-dollar market cap. Where will it come from? Whales. There are 36 million millionaires in the world. 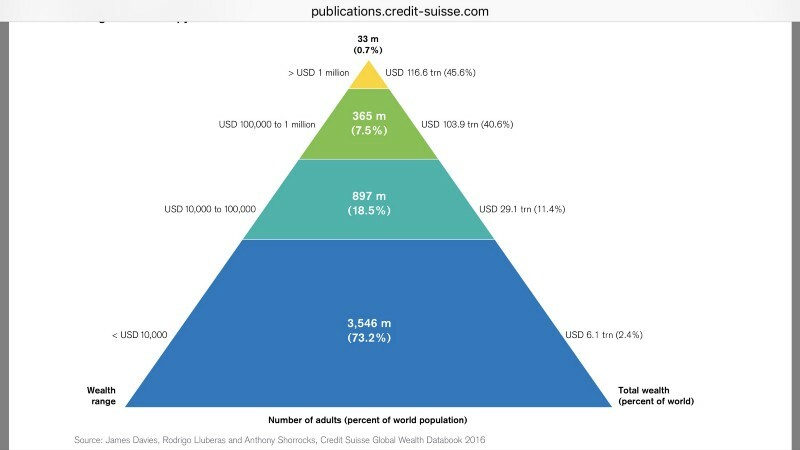 0.7% have 46% of the wealth in the world which makes up for 118 trillion dollars. That means that if they only invest 0.5% of their wealth into cryptocurrency, that would mean an influx of almost 600 billion dollars. Consider also that the price will shoot up due to demand, and we will have achieved a market cap well over one trillion dollars. Due to the entry of institutions and big investors, BTC will see a high rise in price. In the first twelve to eighteen months the market will be as volatile as it is now, but much more erratic due to price manipulation. As we said before, like traders today, big investors are also speculating and FUD-ing out and FOMO-ing in. They just do it with a lot more money. It’s “BTC on steroids”. The swings will be immense. Market cycles (bearish, bullish, consolidation) will last years instead of months and create tiny cycles with different sentiments of their own like some crazy Russian doll that either spits out investors’ money or takes it from them. In the end, at 17 million bitcoins supply, the price of one bitcoin will be at least $58.000 at a trillion-dollar market cap. all cryptocurrency. Other coins a.k.a. shitcoins will die. will be the spark that lights the next bull market that will last twelve to eighteen months and drive the price of one BTC up to at least $58.000 and the market cap to at least one trillion dollars. Although we believe the best time to buy BTC (and ETH) and hold for the long term is now, our current outlook for the short term (less than one month) is bearish. This doesn’t mean it contrasts the inevitable ETF approval. In fact, a shake out now is almost indicative of it since we believe ‘new money’ wants to enter at a low price. The question is: at what low?